Sammy Hagar is back in the tequila business. 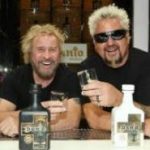 Sammy Hagar sold his remaining interest in Cabo Wabo Tequila in 2010 for $91 million, he has now partnered with his friend and celebrity chef Guy Fieri to create a new tequila to pour next month. They created Santo Fino Blanco with Juan Eduardo Nuñez, the third-generation master distiller who originally worked with Sammy to make Cabo Wabo and later, Santo Puro Mezquila, the world’s only blend of tequila and mezcal, which Hagar launched with Maroon 5 singer Adam Levine. Santo Fino Blanco Tequila will launch in May. Can you believe that Sammy made 91 million on the tequila alone? That’s not including all the royalties for his countless hits in Montrose, Van Halen and solo records. It’s hard for me to fathom that much money. I wanna fathom it. I’m gonna get into the tequila biz. Not just drinkin’ it but makin and sellin’ it.